Cloth Diaper Revival: Road Trip Essentials from Pish Posh Baby! 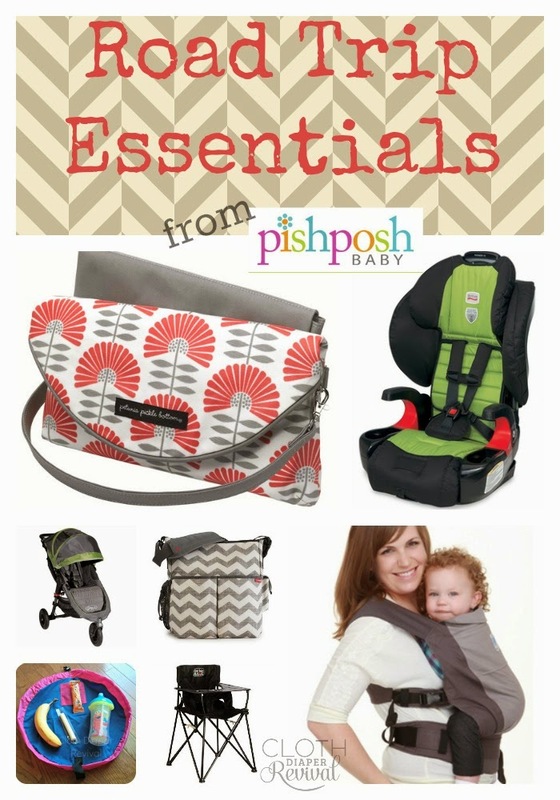 Road Trip Essentials from Pish Posh Baby! Summer is here and that means it's travel season! Traveling with kids is no joke! There is a ton of planning that has to go into every detail of planning a road trip with babies and toddlers in tow. If you're an extreme over-packer like me, it can be hard to narrow down which items you'll really need for your trip. We just spent a week in Florida with our two year old. I started planning this road trip in January, a whole 4 1/2 months in advance! Call me crazy, but like I said, I'm a planner! The trip from North Carolina to Florida was an estimated 8 1/2 hour drive, but didn't include stopping...at all! This road trip turned into a 12 hour trip thanks to potty breaks and needing to eat. I was well prepared for our trip though and had a car packed full of the essentials for a week away from home! Here are some things you should definitely consider taking along on your family vacations! Keep in mind that this list is a road trip list. If you are flying, I would definitely pair down this list a lot! That's a lot of baggage to check at the airport! But if you are driving, you have the luxury of over packing! 1. A good car seat! We all know a safe car seat is a must, but for a 12+ hour trip I wanted my toddler to be as comfortable as possible! Pish Posh Baby has a wide assortment of car seats for every car, budget, and child! We traveled with the Britax Pioneer for our almost three year old. I'll be posting a full review of this seat later this week! 2. A comfortable baby carrier! Depending on the age of your child, I highly recommend taking along a safe, comfortable baby carrier. Your baby will be comforted in being close to you and you'll be hands free to do as you please! Bonus...no exhausted arms from carrying a child that is begging you to do so! 3. Portable high chair - Whether you're camping, staying at a hotel, or even with friends, a portable high chair is a life saver! They fold up compactly and provide a safe place to place your baby when you need to put her down! It can also be a nightmare feeding a baby without their own place to sit. This portable high chair solves all your problems! 4. Lay-n-Go Lite Mat - We love our Lay-n-Go mats! They have so many uses! Store a snack inside and use it as a place mat, keep small toys contained, or even use it for yourself to store your makeup. This thing is a lifesaver and makes clean-up a breeze! 5. A stroller that meets your needs - Whether you'll be at the beach, in the city, or the country, there's a stroller that fits your needs! We used the Baby Jogger Summit X3 for our trip at Disney. It was perfect for navigating the park and provided a shady, comfortable spot for my toddler with ample storage for our stuff underneath. The reclining seat was perfect for his naps in the park. If you don't have a stroller you love, the Mom Reps at Pish Posh Baby are experts in helping you choose the perfect stroller for your family. 6. A roomy diaper bag - Whether your child is in diapers or not, a diaper bag is the perfect bag for road trips! Stock it full of snacks, toys, changes of clothes, whatever! You'll be organized and have plenty of room for everyone's stuff! 7. A stylish changing clutch! Just because you're a mom doesn't mean you can't be stylish! Changing clutches are great for quick trips or out to dinner! Just throw a diaper or two in the clutch with a small pack of wipes. The changing pad will create a clean place to change your baby and you'll love the accessory feel of the print! I'll be sharing more about our most recent road trip this week, including our Disney essentials and a review of the Britax Pioneer car seat! What are your essentials for surviving a road trip? I really like the idea of a portable high chair, and it's something that's definitely on my wish list. Whether it's a restaurant or a friend or relative's house, having a lightweight, comfy and CLEAN place for our baby to eat would be fantastic.